The control unit NF-M is designed to simulate firing up to 15 shots. Missiles can be fired individua .. The NF3E is an innovative product that replaces the previous products NF-3E and NF3X-350. It is newl ..
NF32 is a new control unit for lighting medium-sized model aircrafts with a wingspan up to 1.3 meter ..
NF-INV3 and NF-SD3 are inovated products in the servo accessories category. NF-INV3 is the new se ..
Last year we started with the innovation of existing control units for different models. Currentl ..
NF39 is quadruple switch operated by receiver, designed specifically for switching on and off of the UAV (mulitcopters, drones) lights. 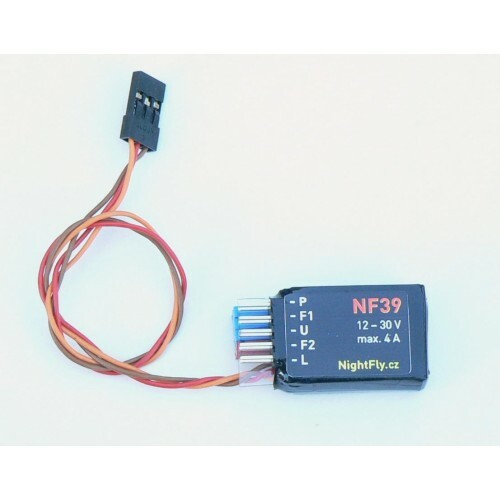 NF39 is quadruple switch operated by receiver designed specifically for switching on and off of the UAV (mulitcopters, drones) lights by transmitter. Two switches are intended for permanent lights, position and landing (P L) and the two for flashes (F1, F2). More information you can find in the section "Documentation".